NGO Kalaküla began development of the Kiideva Nature Centre in 2007. Over the next 2 years, thanks to various financial contributions, classrooom facilities were built, equipment & furniture purchased, wooden meadows restored and a hiking trail from Kiideva to Puise established. To organize bird-watching and outdoor classes, the building of a secure watching tower and information centre was identified as a need to better inform visitors about local natural habitats & wild fauna and flora. The main objective of the project was to establish a multi-functional birdwatching tower and information rooms, aiming to increase visitor numbers to over 3,000 people per year. The wider aim of Kiideva Nature Centre is to create an active base to promote nature related educational activities, provide opportunities for outdoor classes, nature study camps, working and recreational camps. The main activities undertaken by the project included: the design and building of the birdwatching tower/clay-house; organisation of the new information rooms; promotion of the nature centre and of the new birdwatching tower. The new building provides a focal point for the display and dissemination of information about the local countryside, where people can organize different educational activities which can help to discover the local natural habitats. A flag post and a information board are available in the birdwatching tower. 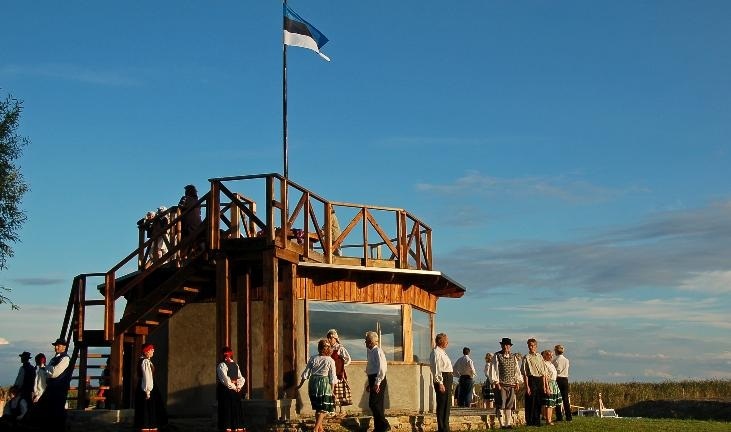 Visitors can enjoy the beautiful view of the whole Matsalu Bay from the platform of the birdwatching tower (36m2), raising local awareness and support for local natural habitats.